Burgers are great because of their convenience. They’re the ideal on-the-go meal. 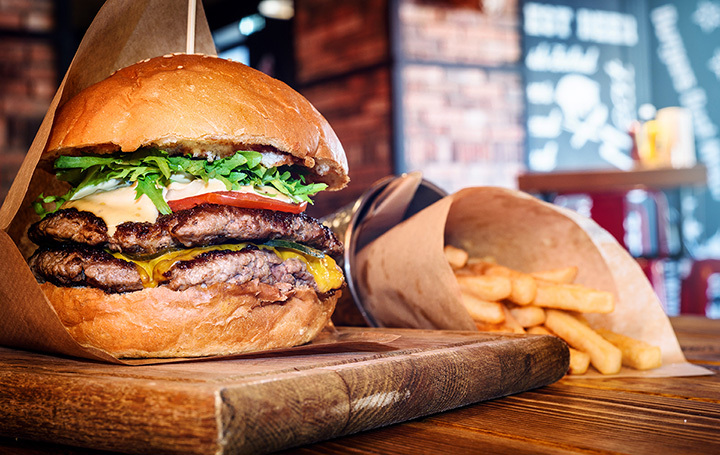 The difference between finding a quick burger to stop that grumbling tummy and finding the perfect burger can be bridged by simply knowing where to look. While the big lights of Las Vegas attract celebrity chefs that know how to make a mean burger, smaller joints through out the state have crafted their own hometown favorites. On the question for that perfect burger, explore one or more of our favorites! The little grill that sure can deliver a big bite in the form of a burger! While they do a good job on the classics, they talent is in their toppings. The 5 Alarm burger packs some heat while the Kielbasa stacked burger leaves your mouth watering. Ready to kick up that burger to a fancy and refined level? This swanky bar slash burger mecca is just the spot. From the Kobe beef patties to the addition of some pretty amazing extras like truffles and foie gras, these are not your average drive-thru burger. The boozy shakes are the perfect compliment to the beefy delights. Archie's is open 24/7 and it the favorite burger spot for the college crowd in town. The burgers are huge and made to tackle any appetite. The Wolfpack is the burger that made them famous, but with a full pound of beef may not be for the faint of heart. The burgers at this upscale cafe are amazing on their own just based on the quality of the ingredients. When you mix in the unique Asian twist, they become almost other worldly. They are the prefect texture and the unique toppings have something for everyone. The sides are also a combination of American comfort food and an Asian flair. The beef that gives these burgers their start is top quality. The toppings are what elevates a good burger to pure date night amazing! Whether you opt for the classic burger or try something a little more adventurous like the Fun-Ghi, there is no way to go wrong in this menu. Whether you are looking for a great take-out burger that rivals those famous burgers the neighbors make out their barbecue or hoping for delivery, this place is a well-guarded secret of the locals. The burgers are hand-pressed and beyond juicy. They will even bring them right to you! If you have ever imagined having a celebrity chef behind the grill, this is your chance with this mix of burgers from none other Bobby Flay. The burgers are just as much fun as Bobby's big personality. The house special is Angus Beef patty topped with smoked cheese and “crunchified” with smashed potato chips. The secret to these unique burgers is the unique way they are cooked. They are cooked over a hardwood flame and covered to maintain the intensity of the grill. You will not find a smoky and deep taste like this anywhere else. Wait times for the large restaurant can sometimes be lengthy but its that good. Locals know it is best to avoid going with larger groups, couples usually have a much lower wait time. The best burgers your local hometown bar can deliver. This place is fun, service is fast and the burgers are dripping with flavor. Whether you are a tourist just visiting Reno or a local ready to catch up with friends at the bar, this is always a great choice for burgers. No one ever leaves hungry. The people of Las Vegas loved these food truck burgers so much they just had to have a stand-alone outlet to get them. A strong Japanese influence can be seen in the wasabi mayo and the artistry behind the beef patties. This is more than just a burger, its a cultural exchange for your mouth!